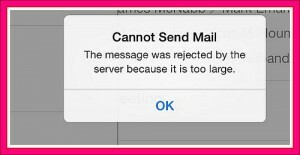 What To Do If Your Ipad Cannot Send Email by AppleRepo.com – Having a bad day with your iPad that is unable to send email? This is really a hassle and may cause delays most especially with your business transactions. There are actually various factors causing this thing to happen. Corresponds to it, are the steps that may help you to figure out what is going on with your device, and through this, you will be able to have it fixed, whether with the assistance of a customer service agent or to fix your iPad on your own. Now, here’s how you do it if you found that your ipad can’t send email problem. iPad has common issues with regards to failure of sending email, you must follow through with the following instructions carefully so that you will not miss any step that will have the process gain a failing result. First thing you must do is the troubleshooting step, which is commonly done by turning off the device and have it on again after 10 seconds prior to what is the given time for restarting. To turn it off, you have to press and hold the power button until the Apple logo will appear, after which, kindly drag the slider and do the same thing to switch it on again. If things still are not working to fix the ipad cannot send email problem, you could proceed to the phone’s settings, go to the mail section, contacts, proceed to the account of whom you are trying to send the email. Then you now have to scroll down to the Outgoing mail server section then choose to tap the SMTP box. Turn all the servers you will see. In the primary SMTP server, you must be sure that all information entered are correct, completing it with all the optional information needed. An optional username and your password will be required in this case if the SSL is on. Instead of having your mail settings synced, just add your email account on your iPad. Do this with the use of iTunes, where you have to select the iPad found in the left side of the list found under the devices’ section, then deselect the Sync mail accounts. Then apply it to proceed with the disconnection of your iPad after the sync method. This time, return to the iPad settings, got o the mail, then contacts, then tap add account. Final step for you to do is to select type of a mail account and follow the next instruction to be given, after you were able to add your email address, your iPad will just follow through your service provider’s settings to work with your email effectively, then if not, you may manually enter your contacts directly, or ask assistance with your email service provider. After doing the steps given above and later you found out that email stills is not working, it is best recommended for you to add your registered free Gmail account and add this to your iPad. You may also check online troubleshooting process or you may call your service provider to fix this Ipad Cannot Send Email problem.